1 Kings 18:20 So Ahab sent to all the children of Israel, and gathered the prophets together to Mount Carmel. 1 Kings 18:42 So Ahab went up to eat and to drink. Elijah went up to the top of Carmel; and he bowed himself down on the earth, and put his face between his knees. 2 Kings 4:25 So she went, and came to the man of God to Mount Carmel. It happened, when the man of God saw her afar off, that he said to Gehazi his servant, "Behold, there is the Shunammite. (1) A beautifully wooded mountain range running for about 13 miles in a south-easterly direction from the promontory which drops on the shore of the Mediterranean near Haifa, at the southern extremity of the plain of Acre, to the height of el-Machraqah which overlooks the plain of Esdraelon. On the top of the promontory, at a height of 500 ft. the monastery of Elias stands. From this point there is a gradual ascent until the greatest height is reached at Esfiyeh (1,742 ft.), the peak at el-Machraqah being only some 55 ft. lower. The mountain-usually named with the article, "the Carmel"-still justifies its name, "the garden with fruit trees." The steep slopes on the North and East, indeed, afford little scope for cultivation, although trees and brushwood grow abundantly. But to the South and West the mountain falls away to the sea and the plain in a series of long, fertile valleys, where the "excellency" of Carmel finds full illustration today. There are a few springs of good water; but the main supply is furnished by the winter rains, which are caught and stored in great cisterns. The villages on the slopes have a look of prosperity not too often seen in Syria, the rich soil amply rewarding the toil of the husbandmen. Oak and pine, myrtle and honeysuckle, box and laurel flourish; the sheen of fruitful olives fills many a hollow; and in the time of flowers Carmel is beautiful in a garment of many colors. Evidences of the ancient husbandry which made it famous are found in the cisterns, and the oil and wine presses cut in the surface of the rock. There is probably a reference to the vine culture here in 2 Chronicles 26:10. In the figurative language of Scripture it appears as the symbol of beauty (Songs 7:5), of fruitfulness (Isaiah 35:2), of majesty (Jeremiah 46:18), of prosperous and happy life (Jeremiah 50:19). The languishing of Carmel betokens the vengeance of God upon the land (Nahum 1:4); and her decay, utter desolation (Amos 1:2 Isaiah 33:9). Roughly triangular in form, with plains stretching from its base on each of the three sides, the mountain, with its majestic form and massive bulk, is visible from afar. Its position deprived it of any great value for military purposes. 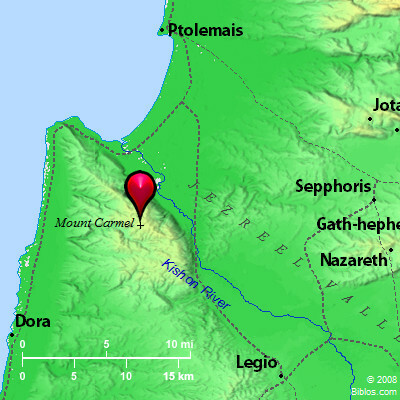 It commanded none of the great highways followed by armies: the passes between Esdraelon and Sharon, to the East of Carmel, furnishing the most convenient paths. But the mountain beckoned the fugitive from afar, and in all ages has offered asylum to the hunted in its caves and wooded glens. Also its remote heights with their spacious outlook over land and sea; its sheltered nooks and embowering groves have been scenes of worship from old time. Here stood an ancient altar of Yahweh (1 Kings 18:30). We may assume that there was also a sanctuary of Baal, since the worshippers of these deities chose the place as common ground for the great trim (1 Kings 18). The scene is traditionally located at el-Machraqah, "the place of burnt sacrifice," which is still held sacred by the Druzes. A Latin chapel stands near, with a great cistern. A good spring is found lower down the slope. Just below, on the North bank of the Kishon stands the mound ca11ed Tell el-qissis, "mound of the priest." From the crest of Carmel Elijah descried the coming storm, and, descending the mountain, ran before the chariot of Ahab to the gate of Jezreel (1 Kings 18:42). Under the monastery on the western promontory is a cave, said to be that of Elijah. An older tradition locates the cave of the prophet at ed-Deir, near `Ain es-Sih. It may have been the scene of the events narrated in 2 Kings 1:9. Elisha also was a familiar visitor to Mt. Carmel. It was within the territory allotted to Asher; in later times it passed into the hands of Tyre (BJ, III, iii, 1). (2) A city of Judah, in the uplands near Hebron, named with Maon and Ziph (Joshua 15:55). Here Saul for some reason not stated set up a monument or trophy (1 Samuel 15:12; literally "hand"). It was the home of Nabal the churlish and drunken flockmaster, whose widow Abigail David married (1 Samuel 25); and also of Hezro, one of David's mighty men (2 Samuel 23:35 1 Chronicles 11:37). It is represented by the modern el-Karmil, about 10 miles to the Southeast of Hebron. Karmil is the pronunciation given me by several natives this spring. There are considerable ruins, the most outstanding feature being square tower dating from the 12th century, now going swiftly to ruin. There are also caves, tombs and a large reservoir.